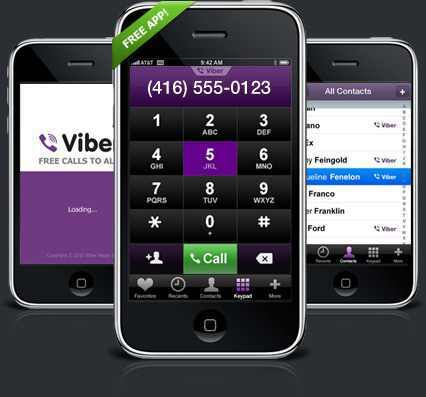 Viber is an iPhone application that lets you make free phone calls to other iPhone users that have Viber installed. When you use Viber, your phone calls to any other Viber user are free, and the sound quality is much better than a regular call. You can call any Viber user, anywhere in the world, for free. All Viber features are 100% FREE and do not require any additional “in application” purchase. Moreover they are coming with Free SMS and Android and Blackberry versions coming soon! * NO HIDDEN COSTS: Once you and your friends install the free Viber application, you can use it to talk (and soon also text) as much as you want. Talk, talk, and talk some more and it’s all free. Just makes sure all your friends get Viber! All you need is an Internet connection: 3G or Wi-Fi where available. * COMPLETELY FREE AND WITH NO ADS: Viber and all Viber features are absolutely free and do not require any additional “in application” purchase. On top of that, Viber doesn’t contain any annoying ads. * NO BUDDY LIST: Viber automatically highlights friends in your iPhone’s address book that have Viber. That way you know who you can call for free! * CALL ANYONE WITH VIBER, NOT JUST YOUR FRIENDS: Want to dial a number and don’t know if they have Viber? No problem, make the call with Viber and if they don’t have Viber the call will be made using your regular phone – but don’t forget to invite your friends to Viber so your next call is free ;). * YOU CAN ALWAYS RECEIVE A CALL ON VIBER: If your phone is ON then so is Viber. Always ready to make and receive phone calls. No need to log in, or “go online” to receive a call. * MISSED CALL NOTIFICATION: Even if you missed your Viber call because your iPhone was off, or there was no service, Viber will notify you of your missed calls as soon as service is restored. * SOUND QUALITY: Viber uses state of the art technology in order to make sure the sound quality you get is much better than GSM or a regular phone call. * IPOD TOUCH and IPAD support is almost here! * MUCH MORE COMING: This is the first release of Viber. We are hard at work bringing many more features to your Viber phone. Free text messages, more ringtones (and custom ones), wallpapers, location based services and more are all coming soon to Viber! SBPhotoDla| from modmyi brings the ability to easlly create photo speed dial loons directly on the springboard. Use the Image associated with the contact In the address book or select any image stored on your lPl’|one, You can even take a new photo with your camera directly trom the app. Icons are perfectly proportioned and retlna resolution on the iPhone 4. The icons are standard iPhone webclips, so that they can easily be moved or deleted. ls developed by the creator ol |B|ank.